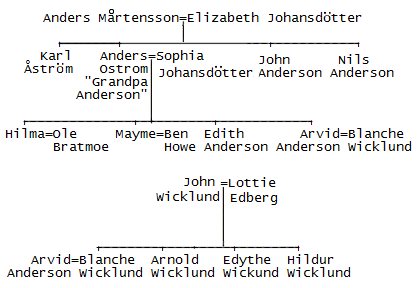 This is the family history of the Anderson, Ostrom, Åström, Howe, Wiklund, and Edberg families of Sweden, Minnesota, South Dakota, Washington and California USA. I’m writing on behalf of my dad, who was born in Vermillion, South Dakota and “wintered” in Center. His name is Courtney Lindell (b. 1933) and his parents were Siri and Charles “Walter” Lindell. The family moved out to Washington state in 1941, but my dad still talks about Center, SD like it was yesterday. We are now in Bellingham, Washington, but the original Lindells came from Sweden in 1881. As far as I know, they were concentrated mainly in a small town called Canova, but lost most of what they had in the Depression. Walter Lindell, my grandfather, worked for a road-building outfit, and my dad and the rest of the family lived in an 8 x 12 foot trailer-house that they towed behind a car. He has great memories of South Dakota, and I will be passing along your stories to him via email.